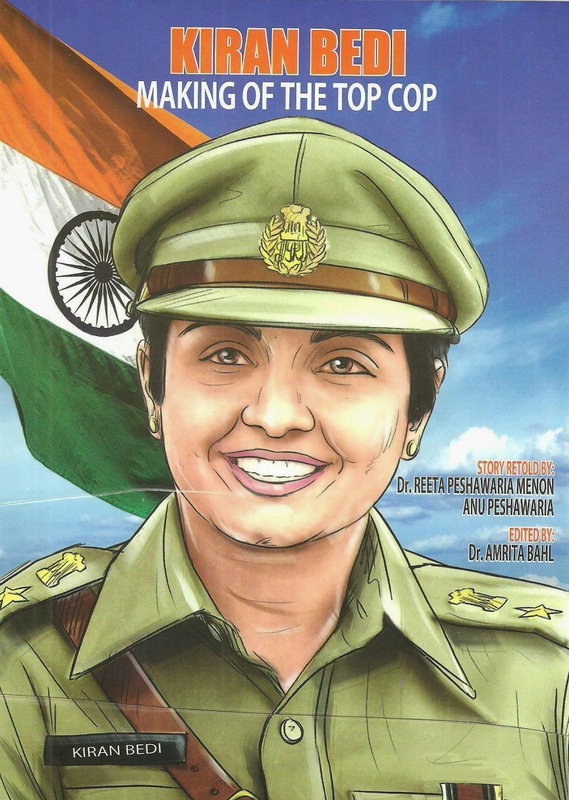 An illustrated story Book KIRAN BEDI: 'MAKING OF A TOP COP' for youth-14-18 age group. 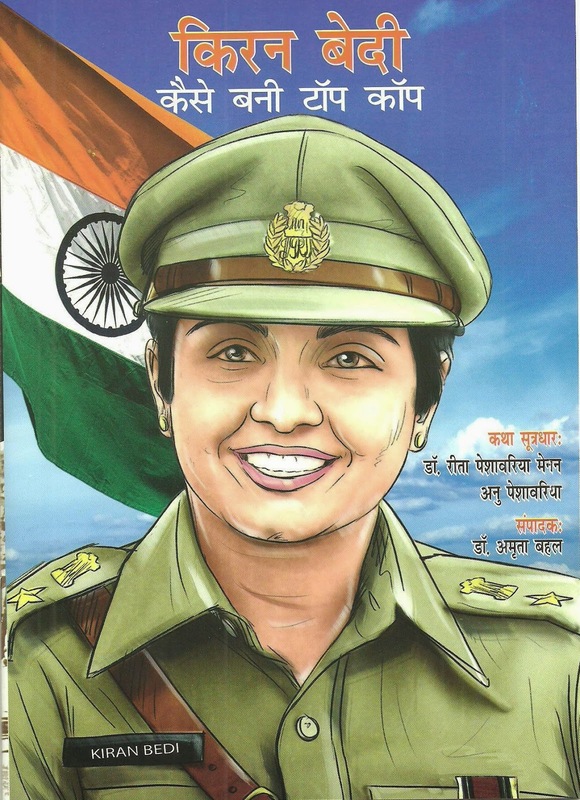 Here is an illustrated story Book KIRAN BEDI: 'MAKING OF A TOP COP' for youth-14-18 age group. Contact undersigned to place bulk orders. On receiving an invitation from the Birla Institute of Technology and Science (BITS), Pilani, I was asked what would be my preferred subject for addressing thousands of students assembled for their annual festival. The topic that came to my mind in a flash was “future in our hands”, which related to youth. Having lived a professional life of 40 years with all its challenges, I am convinced that the Indian youth now should take the country in own hands. Until recently, it was in the hands of the moneyed, the powerful, the influential, the ageing. Now, at places, it has moved into the hands of the younger leaders who are knowledgeable and know what they want. How else could we have imagined a chief minister in his forties heading one of India’s largest states? People have elected him as reward for his persistent hard work and merit. No doubt, his party values him; but he’s there because he has mass appeal, and every bit of it is earned. I divided my presentation to the youth audience at BITS-Pilani into two parts—first half about the evidence of what was not in our hands, and the second about present, which has to be seized. I put my thoughts on slides, on how large-scale siphoning of funds had been exposed in the run-up to the Commonwealth Games, with the government ignoring all allegations and the police not even willing to register an FIR (first-information report), forget investigating the case. More exposés followed—the 2G scam of botched auctions caused serious loss to the exchequer, as the office of the Comptroller and Auditor General (CAG) of that time calculated. Close on its heels was the coal-block allocation scam, which led to cost escalation and power shortages, besides a mounting import bill on account of coal requirement. All three cases are under prosecution and active investigation. I reminded the audience of budding engineers that while many of their senior alumni were creating avenues of growth, many others might have been part of the unethical goings on within the government or business leadership. There were no clear voices speaking out, barring an occasional whistleblower. Many qualified students from prestigious institutions such as BITS-Pilani do join the civil services and some get to high positions. They might have become part of the environment by either remaining silent or falling in line. How else do we explain scams and crony capitalism? How can corruption happen unless there is a collusion of the government and business? Over a period, a cosy nexus has developed among the people in powerful positions as givers and receivers. I reminded the young people in the audience that they too would be in influential positions soon. Will they then take the country into their hands for larger good by personal and collective ethical leadership? The best evidence of a beginning being made is in the way the youth came out in large numbers to vote on the issues of development, growth, integrity, infrastructure, skills, and quality of life. They do not want things to remain as usual. In the second half of my presentation, I alert them to what the country now expected from her new business and government leaders. Foremost of what they have to take in own hands will be accountability, transparency, inclusiveness, innovation, entrepreneurship, social engineering. They should not stash black money in overseas banks as many of their seniors have; but earn their wealth and pay their taxes. The youth should know that half of the country’s population has no access to toilets, a third of it does not have safe drinking water, and the majority lives on less than Rs. 100 a day. The country has a benevolent strong man at the Centre but we as middle management, the level where most professionals start, have to be aligned with the changes, replacing chaos with order. Research establishes that change happens and is sustained only when middle management wants it. In climate-change-impacting areas, the architecture has not to be of glass panes but of brick and mortar. Did we not hear of the destruction of the Vizag airport in the recent cyclone? Big window glasses flew in all directions. Was the airport architecture in tune with coastline challenges? Who designed and built it? Were they building for the future or the past? Whenever we plan something, we have to consider future shocks. Youth should no more be bystanders but be catalysts of change and reform. They need to network and be entrepreneurial. They should let the government know where it is going right and where not. They need to speak up, more so when ideas and feedback are being sought. If we do not conquer chaos, chaos will conquer us. The youth need to reclaim the country. Staying engaged as social engineers along with their education degree, starting from school, is the way forward. “Take the destiny of India in your hands by knowing, wanting, and doing,” was my closing line.